A good duet only previously mastered by Bowie/Bing Crosby/Dr. Girlfriend/The Monarch. If you’re a certain type of incredibly cool weirdo during the Christmas season, then there are few songs more ubiquitous in your particular circle of cool ironists than Bing Crosby singing “Little Drummer Boy” and “Peace on Earth” with then brand new singer David Bowie. The video was meant to be a mixture between new and old talents, and it’s absolutely charming, showing the complete warmth of both men. You fire it up along your blu ray of ‘Female Trouble’ and whatever early Tim Burton movie you have lying around to celebrate the holiday season. 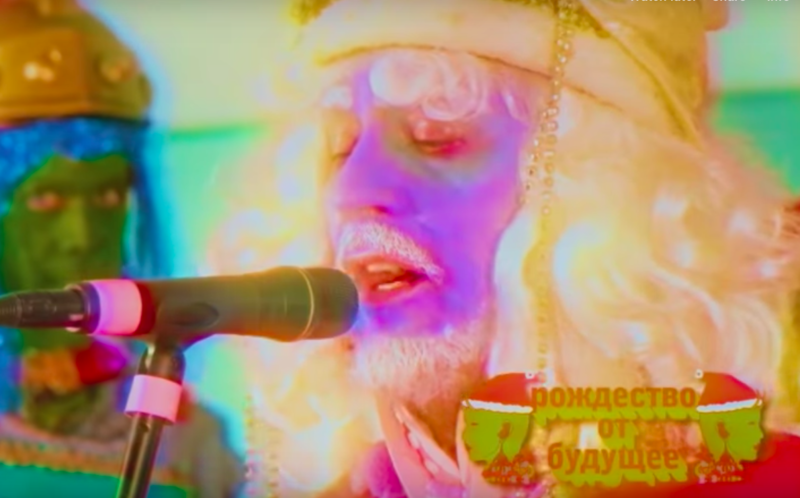 The Flaming Lips however are here to bring you a little update on the classic with their own rendition on the classic song combo in a surreal and beautiful video, here yo give you the much needed weird culture that you so need. The graphic in the corner reads “Christmas of the Future” in Russian. The Flaming Lips are dressed as neon green centurions as a well groomed front man stands in the center and sing the incredible ballad. Beautiful. Us weirdos get kind of left behind during the holiday season! Sure, there are a lot of wonderful masterpieces from the past, but one each year? Goodness, we wish! Mutant Russian Centurions are exactly what we need right now, in a season of normies running our most normal holiday into the eye of a normie hurricane (normiecane?). And if you haven’t seen the original Bowie/Bing masterpiece, check it out below. If you haven’t seen it before, what are you doing!? Why are you wasting your time that could be spent watching this Bowie masterpiece? I am proud of you when you watch it and angry before you do! Also, if you’ve ever wanted to hear characters from Adult Swim’s work of art “The Venture Bros” sing the damn thing, well, here it is below. Alright, that’s enough Christmas for one entry. What do you think of the new video? Let us know in the comments or on Twitter at @WhatsTrending.